A video presentation of your wedding can become the most entertaining memory of your wedding day. It is a crucial part of your wedding, and you should treat it accordingly. 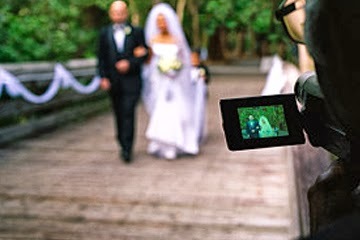 You have many options to have your wedding videographed. You can have a friend or family do it for your, or you can hire a professional. If you hire a professional you need to consider several issues. You need to make sure you are hiring an experienced person. You should view their previous work and ask for sample footage. On the demo you want to look for clarity and an overall feel for the work. The steadiness of the camera is another point to consider. Make sure you understand what is included in the final product you are purchasing. Is it a DVD? What is the expected duration of the video? How many cameras are used to produce the movie? Ask to see if you can include photos and other video footage? Make sure you can select the music you want. Will they provide you with the raw footage, so you can later edit it yourself? It is best if the videographer is familiar with the wedding ceremony and reception venue. Ask to see if they are willing to visit the location prior to the wedding to become familiar with the place. The visit should give the person clues about angles, lighting, and other important factors. Be sure the videographer understands the schedule of your wedding. Explain to them the most important aspect to the wedding. They have to understand what is the most important to you. Perhaps there are certain people, or places that you want him to emphasize. The more they understand what you are looking for in the video the better they are equipped to make the most memorable product for you. Your wedding is a once in a lifetime experience, so do everything you can to preserve the moment.